Introducing our new on board menu with selections inspired by Food Network Canada Celebrity Chef Lynn Crawford. Experience the Difference™ is at the heart of everything we do at Sunwing because you deserve a unique vacation unlike any other. This is why we’ve enhanced our Sunwing Café menu to offer our passengers an even wider selection of quality, fresh and affordably-priced meal options. To ensure our choices exceed the expectations of all of our travellers, we are continuing our partnership with Food Network Canada and award-winning celebrity chef Lynn Crawford, to inspire new creations to our menu that are sure to please every palate. Plus, you can easily guarantee your choices with the new online pre-ordering system, where you can order up to 72 hours in advance of your flight. The new menu also features a selection of additional hot meal options, including a hearty cheese tray of creamy havarti, cheddar, smoked gouda, green apple slices and lavash crackers, an Angus beef burger topped with cheddar cheese served on a sesame seed bun, and a new selection of beer that features Budweiser, Mill St, and Stella Artois. Plus, you can still enjoy old favourites such as the Margherita pizza, a tapas box, and flavourful range of beverages. Perfect for children, our Kidcations snack box is designed just for tiny travellers, with fun and healthy snacks little hands will love. Food Network Canada's Celebrity Chef Lynn Crawford does exactly that in her popular TV series Pitchin' In on Food Network Canada as she travels across North America and meets with farmers and fishermen in search of the freshest and tastiest ingredients. Whether it's foraging for mushrooms off Oregon's treacherous coast or reeling in reluctant 70 pound halibut in British Columbia, Crawford is up for everything in her search for the best and tastiest. 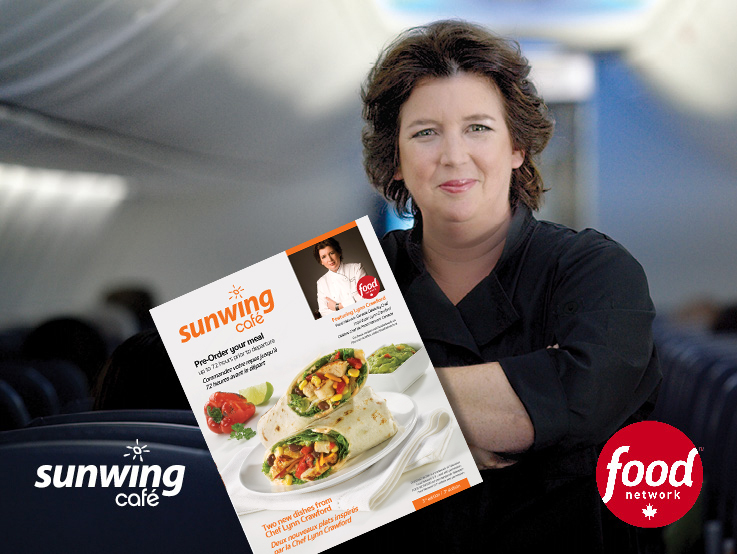 Crawford continues to bring her love of food to the passengers of Sunwing Airlines by working with the Sunwing team in developing some of the new Sunwing Cafe menu items now available on most flights. Food Network is a trademark of Television Food Network Canada G.P. ; used with permission.